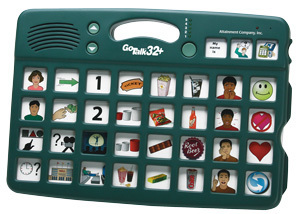 Functions like the GoTalk 4+, Go Talk 9+, and GoTalk 20+ but with 32 message plus three core vocabulary keys. The Go Talk 32+ has five levels, giving this talker a 163 message capacity. The message keys record for 8 seconds and the core vocabulary keys record for 17 seconds. It also has a quick record feature, volume control, a built-in handle and keyguard, an overlay storage compartment and instructions printed on the back. Includes 2 AA batteries. Size: 36 x 25.5 x 4cm. Weight: 935g Recording time: over 27 minutes.